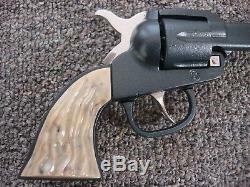 Big Horn cast iron toy cap gun, made by Kilgore 1939. Measures about 8 1/2 inches in length. This is the extremely rare 1st model variety in the blue finish. 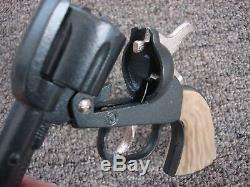 Cast iron cylinder, hammer and trigger are nickel. "It's among the rarest of blue finished toy guns" ("Backyard Buckaroos Collecting Western Toy Guns" by Jim Schleyer). 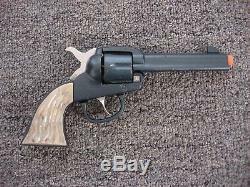 This toy gun was professionally restored by master cap gun repair man, Frank McMath. It is in virtually NEW CONDITION and works perfectly. 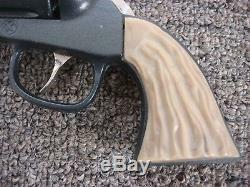 You will not find a nicer version of this extremely rare cap gun! A center-piece of any toy cap gun collection! This replica gun contains the colored markings required by law, including a permanently attached orange plug. 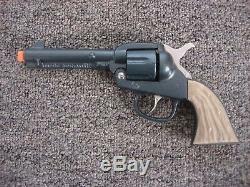 The item "Big Horn Cast Iron Toy Cap Gun Kilgore 1940 RARE BLUE FINISH" is in sale since Saturday, January 26, 2019. 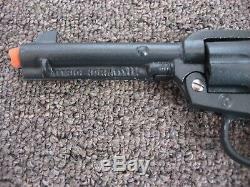 This item is in the category "Toys & Hobbies\Vintage & Antique Toys\Cap Guns\Cast Iron". 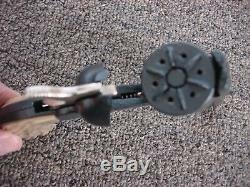 The seller is "toygun" and is located in Pleasant Grove, Utah.